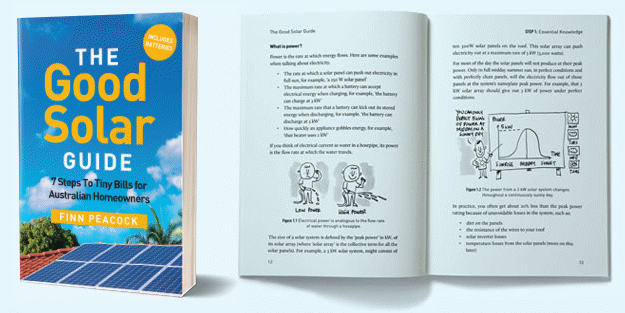 Discover the simple reasons your 5kW solar system output is too low. Is your new solar system producing the power output it should? A very common question I get from people who have just got a new solar power system is: “Now the solar panels are on my roof, how do I know what the solar system output should be?”. The solar power system owners are usually a bit concerned because they have bought, for example, a 5kW system but their inverter is telling them that they only got 4kW of peak power yesterday! Where’s the missing 1kW? Most people expect a 5kW solar system output! Thanks for your advice. Much appreciated. I had a system installed via you, all very nice and well installed on Thursday 15/3 and very pleasant people to deal with. 5 KW , 20 x 250 W ET panels with a Sunnyboy inverter. During the test we have measured at peak at 14:20 4.7 kW and we were very pleased. After that day we had some hotter and more sunny days but the capacity of the system always stays below 4 KW at peak. never go above it, strange. Today a hot clear day 25kWh at peak 4kw. May I have your opinion about this and can i expect to reach the 4.7 KW again? What Solar System Output should Hans be getting from his 5kW system? A fact that isn’t advertised widely in the solar industry is that most solar systems in Australian conditions will usually peak at only 80% of their specified peak power. This is actually completely normal in almost any industry that sells hardware that has associated specs. Think about the last time you bought a car with a specified fuel consumption from the manufacturer. Did your car actually ever achieve that fuel efficiency on a day-to-day basis? Thought not! Solar panel systems usually reach only 80% of their specified peak due to “system losses“. So what are these system losses, and how can you work them out for the solar power system sitting on your roof? In Hans’ case he is using ET Solar 250W solar panels. He hasn’t told me the model number, but there are 3 matching panels in my Solar Panel Comparison tool. I’ll assume he is using a ET-P672250 and use those specs in the calcs. Solar System Losses Add Up! All panels have a power tolerance. In the panels that hans is using, this is -1%/+3%. So worst case is that the specifiedpower output is actually 1% lower than spec. I wrote an entire blog post on solar panel temperature losses. To cut a long story short, solar panels don’t like to be hot. Most solar panels lose about 10% of their rated power on a 25°C day, more if it is hotter. Let’s assume 10% for this estimate. When your solar panels are put on your roof, airborne particulates like dust will settle on the panels’ glass. These particulates block the amount of sunlight reaching the solar cells behind the glass reducing your power. The reduction in power from particulate build up typically lies in the 5%-15% range. Hans’ panels have just been installed so we’ll assume only a 5% loss. All the solar panels on your roof are interconnected with wires, then a long pair of DC wires connects the final solar panel to your inverter. All these wires have a small electrical resistance, which means the electricity flowing through them will suffer a voltage drop. This will reduce your power proportionally, typically by around 2%. Everything goes through your inverter so the inverter efficiency will directly affect your system output. Hans is using an SMA Sunny Boy inverter. If he has a modern, transformer less model, he can expect an inverter efficiency of about 96%, giving a 4% loss. Multiply all those together (see the pic on the right) and you are looking at 20% total losses, giving a real world peak power of 4kW – which is exactly what Hans was seeing. But what about the 4.7kW he saw on the first day? That was probably down to 3 of things. Firstly Hans tells us that the days following this reading were hotter. So there would have been higher temperature losses later on. Also, after the first day, a thin, almost invisible layer of dust probably quickly settled on the panels increasing the dirt losses from a starting point of zero. Thirdly, the panels can initially degrade a percent or two in the first day or so, before they “settle in”, after which they should degrade a lot more slowly (about 0.5% per year). Take all these into account and it would explain why Hans has not seen his 4.7kW peak power since. I have a 10kw solar on grid system running at my roof , I have used ABB trio 10kw inverter and waaree solar panels 320wp – 48V , 72 cell . My initial peak power recorded was 8400W, which is slowly reduced to 6500 to 4000 to 2500 in a month time. What is the possible reason for such drastic changes? I have checked the DC side connections and they are all good. Even inverter does not show any error message. The only “good” explanation for that deterioration in output is the panels have dirt on them. I call that a good explanation because dirt can be cleaned off. You could have one defective panel that is reducing the output of the entire system, but if you have two arrays of panels of roughly equal size, one attached to each MPPT on the inverter, then I would not expect one bad panel to result in such a larger deterioration. I’m afraid you will probably have to get your installer to check the system. Also, as your post is in April, are you comparing output in Dec/Jan with later in the year? The total output will reduce significantly between Summer and Winter. Wondering the feasibility of adding a wind turbine to a 5.1 solar system I am up country so no neighbours thinking 2KW practical or not ? I’m afraid I’ve never seen a micro wind turbine that was low enough in cost to compete with simply adding more solar panels. Not only do they have a high up front cost but they are far more expensive to maintain as they have moving parts. A few people have them but it’s generally because it is something they are interested in than because they intend to save money. Dear Sir, my panels produced 94kw according to my last bill and my useage is 224kw in the house. Origin paid me 6c. credit for the 94kw, what I would like to know is how do I get Origin to subtract power generated subtracted from power used ie 224kw-94 kw = 130kw and then be billed accordingly. I think they produced 94kWh… ( http://www.solarquotes.com.au/blog/kw-and-kwh-what-is-the-difference/ ) sorry – the extra “h” means a lot to crusty old electrical engineers like me! I’m afraid that you are on a NET FIT so Origin won’t subtract the 94kWh from the 224kWh and only charge you for the remaining 130kWh at your standard tariff (probably about 25c per kWh). They will look at what was exported on a second by second basis and only credit you 6c for that electricity. Hi, would it be a good idea to add additional panels to counteract the expected losses mentioned in your blog … Say an extra 10-20% worth of panels 6kw of panels with a 5kw inverter ? And would this be acceptable to Energex ? I have noticed that most Inverters are rated at their relevant size e.g. (3kw inverter rated at 3000, 4kw @ 4000,) BUT the 5kw inverters seem to only be rated @ 4600 Why is this ? why are the 5kw inverters rated at a reduced Ac power rating ? I have had a 3 kW solar system in Melbourne since early 2010 and it has been a complete failure. The solar power credits have averaged $30 – $50 per quarter with no noticeable drop in usage from the grid. The installer, Modern Solar, cannot explain the poor performance of the system and completely refuses to do anything to improve it. Is there any reputable tester I can get to assess why the system is not working? If you would like me to recommend someone local who can look at your system, then let me know. They will probably charge about $200 to inspect it but they will give you an expert diagnosis. You should be getting about 12kWh a day generated averaged over a year. That would be great – I’d be happy to spend $200 to find out what’s going wrong. Well i’m running a baby one,, basically I have 6x250w mono panels hooked up to a 60amp regulator that only goes off grid. I’ve turned my power off because I don’t believe electricity should be worth 24.4 cents a kWh. At the moment its approaching summer and I’m getting around 1200 watts in the best hours of the day or 8-9 kWh’s a day. I know the panels are not at the right angle and that is usually the biggest mistake people make but its near impossible for me to change them because they’re on the roof of a very large building. Resistance also plays a big part in off-grid. The fuller my batteries become the less I can use to charge the 34kwhs of battery power I’m using. Before hooking up to solar I used roughly 12kWh’s a day but with a lot of changes such as instant hot water and a laptop instead of a big computer i’m using around 5-6kWh’s a day. I’ve heard lots of people having problem hooking up to the grid and I don’t trust electricity companies, They’re out for as much as they can get like every other business these days. Would be nice if business picked up some of that “for the people” power thing that was fashionable in the early years. I had Moderns in and they tried really hard to sell me a 3 kW system on the south west facing side of the roof because that was the only spot they could put 16 panels. Had to sign the contract just to get the salesman out of the house at 7pm. Followed up the next day with a letter to cancel the contract. Eventually went with 1.5 kW facing north west with another vendor – 2 k$ vs 8 k$. That does not surprise me at all about Modern Solar. Being stand alone, I installed mine mostly myself although with a little help from a solar guy who charged me $150 and made sure they were ok. for the panels and the cable and roof rails etc 6 panels cost me around $1250 plus cable $60 plus rails $250 plus a breaker box $40 = $1750. Thats not installing anything to do with a new electricity panel or grid tie inverter either. So $2k is pretty dam good because the grid tie inverter is likely to cost $2-300. My off grid one that is 5kw cost $490 for a cheap powerjack from china. I know grid tie ones can get very expensive too so you’ve done very well. I am in the process of finding a solar system and so far the one that strikes me so far is 13 sunpower panels rated at 327w and a sma sunnyboy 4000tl inverter. (11170 fully installed) 6 panels on east and 7 panels on north .If I understand correctly this amount of panels exceeds the CEC guidelines of 2013 for this inverter. Is this correct? So how many panels can I have hooked up to a 3 kW inverter ,I previously have 12 x250 watt panels now,my other question is I want to go a little bigger and put a 5 KW growatt inverter and another 10 panels where is the best company or best electrician to get these done,I previously had true value solar put this last lot up ,good price but don’t know if good choice any advice grateful thanks…….Eddie. If you want to upgrade your solar system then the first thing to check is how it will affect any Feed In Tariff you are currently on. Some states will let you upgrade without penalty,in other states you have to be careful how you do the upgrade. I had an Eversolar 5kW inverter installed with 20x250w TNS Black a Max solar panels. We live on rural property in Wedderburn NSW 2560 which uses the usual electricity and our water (water pump), flushing and septic tank all work through electricity. We have an average daily usage of 29kWh. All our 20 panels are facing West, but at around 2.30pm I have notice that around 5 panels have a fair bit of shade on them due to the fact that we are on acreage with a lot of very tall tree’s. We have received two quarterly bills since having the solar system and on both bills we have only had a saving of around $100. The inverter shows that it generates around 17kW on average per day. Should I have had a bigger inverter and more panels installed to accommodate for our needs. As the solar panel company has advised me that the system is working to near capacity according to the Clean Energy Council. At the point of sale I was told by the sales rep that with a 5kW inverter I should have around a 75-80% saving per quarter on our electricity bills providing we use our electricity the same as we usually do. First thing to determine is whether your system is performing properly (I can tell you now that if it is shaded from 2:30pm it is almost certainly not). If your system is not performing as it should – and the installer did not warn you about the shading issues – then I would argue that they are at fault. Hi there i have just installed a 3.16kw system seems to work okay but it has a real time peak of only 2000w has never got higher than 2.1kw, LIve in melbourne and was expecting about a 20 % loss but 30% seems a bit high. 12x260w Jinko panels with a ABB one 3kw inverter. Bear in mind that it is Autumn, so the sun is not super strong. First of all I would like to say thank you for making a complex subject understandable to non professionals like all us. My Question is I have 16 Phono poly 500w in a true North alignment at about 15 degrees angle. I am running them into a grid tied 3kw Fronius inverter about 4 years old. My difficulty is that for about 4 months in winter I have varying degrees of shadow across some of the panels from very high Camphor Laurel trees situated a little West of North for about 3 hours per day. I am considering having Tigo optimisers fitted to the system to try to lessen the damage. I have been quoted $2000.00 for the job. The cost does not bother me but I would like to have your opinion concerning optimisers. I live in South East Queensland. Tigo optimisers are good by all accounts and can be used with any central inverter. They will reduce the effect of the shading. How much by is hard to quantify – so it is hard for you to work out the payback of the optimisers. Hi Finn, I 6kw system installed, (5kw inverter) with two different different strings of panels of 3kw one NE and one NW, my production has been quite low compared to pv output figures in my area. My peak power maxes out at 2.4 to 2.5kw. I am concerned that all my panels aren’t working, any tips or tricks to work out if this is the case? If your panels are clean and unshaded, then it certainly sounds like there is a problem with your system. If it is in warranty – then get the installer back to do a system test. Otherwise – expect to pay about about $200 for ann independent installer to test the system for you and find out what the cause is. This has been bothering me for quite some time. The day after our 3 kW system was installed we got an output of 3kW. It has never got past 2.5kW since. I thought there must be sometime wrong with system. Your article clears things. Thanks. Hi, I recently had a 5kw Fronius with 5.6kw of panels put in. I expected it to go gangbusters yesterday as it was a cloudless, sunny day, but the best it could do was 4.9kw. Is this normal? Hi David, yes that’s quite normal. An output of 4.9 kilowatts is 87.5% of your panels’ 5.6 kilowatt capacity and heat, dust, sub-optimal orientation and other factors can easily account for the shortfall. Note that with a 5 kilowatt inverter you will never be able to get more than 5 kilowatts out of your system, but as you can see, you are very unlikely to be losing any significant amount of power due to this. Thanks for that. I had someone tell me that a 5kw inverter will never put out 5kw, is this true? Pus my panels are Risens so I’m not sure if they are that great? I’m afraid a 5 kilowatt inverter will never put out more than 5 kilowatts of AC power. But because panels so very rarely produce their rated output, having panel capacity greater than your inverter capacity is not a bad idea. I don’t think Risen panels are a bad choice. They are tier one and have a 12 year product warranty which is better than the usual 10. Risen is also apparently the most financially sound of the large Chinese panel manufacturers, so hopefully they will be around for a long time to come. I installed a 9.2KW system 3 years ago. Over that time the best they generated was 7.2KW which occurred only for one day. Accounting for system losses, I have suspected that the system is not generated what I was sold. The installer has not returned my calls or emails asking for their advice. I would say on average, they generate about 5 to 6 KW. Hello Keith, Ronald here. It is possible for a 9.2 kilowatt system to only produce a maximum of 7.2 kilowatts, particularly if it is not facing north. One reason for the low maximum output is the system might be inverter limited. This occurs when the inverter capacity is smaller than the panel capacity. I don’t know where you are, but the general rule of thumb for Australia is a system should produce an average of around 4 kilowatt-hours a day per kilowatt of panels. Less in Melbourne or Tasmania and more in Central or Northern Australia. Panels that face east or west instead of north produce about 14% less. So I would expect a 9.2 kilowatt north facing system to produce around 36 kilowatt-hours a day, if there is no shade falling on the panels through the day. Few days ago we install a solar system with 5 kw inverter and use 8 panels 250watts .but the issue is that inverter shown the total 1.2kw. whats the issue. whey he not give 2000 whatts? Detail we use 4 panels 250w in series make it 64 Ampere and other 4 are same.total panels are 8 in 250w. And inverter is mppt 5kw. plz tell me whats the reason. and 1 moor plz on a 5kw inverter how does panals install ? It’s so funny to me that you point your panels North! Great website. If two panels are placed on top of each other panels 1 produces 100 percent and panel 2 produces 0 percent. But as the distance between them is increased the shadow on panel 2 decreases and the output increases. So at what point is the output of both panels equal? Also is the relationship linear or expoental? It could be very far maybe a mile… I mean kilometer but I’m very curious! Thanks mate. I recently had a 10.26kw system with 10kw zeversolar inverter installed at my home. This is 38 275watt directly north facing panels at 25° tilt. My roof gets full sun with no shading from 6am through to 5pm. Over the last week I have averaged 45kwh a day; which i thought was good (google is telling me that is average). I would have expected better yield as my installer said this was the optimal solar setup. Further to this my brother has just installed a 6kw system with similar gear at the same time and no north facing panels and he is getting 35kwh average. Is this normal/is my system underachieving? I am afraid I don’t know where you are, so I am going to assume you are in Sydney as that is Australia’s largest population center. Sunrise to sunset there is roughly 6:00 am to 8:00 pm at the moment, so your system is missing out on about 3 hours of sunshine a day, but the final 3 hours of sunshine isn’t going to generate a huge amount of electricity. It will only cost you about 14% of your generation. So your average for December in Sydney should be maybe 38 kilowatt-hours a day. But on a day of full sunshine without clouds you should be able to generate perhaps 50 kilowatt-hours. So if the 45 kilowatt-hours you are generating is from cloudless or mostly cloudless days I would say that seems reasonable. Your brother’s system is doing really well and its output is very high and my guess is its average over time will be considerably under that. Note that where you actually are can throw this off. If you are in Hobart you are doing extremely well and if you are in Cunnamulla you have reason to be disappointed. Thankyou for your reply. I thought i covered all the information; apologies. My brother and I are both in Brisbane (40km West in Ipswich to be specific). Based on my sunrise & sunset hours; I only really miss out on 1-1.5hrs of daily sunlight. The difference between mine and my brothers system is that all my panels face north; whereas he has 14 east-facing and 10 west-facing panels. Also his eastern panels are shaded from 3pm. This is why i question my output compared to his. I just would have expected that since my system is approximately 30% larger than his; and in a more optimal setup; i would achieve approximately 30% more yield. (Less the usual factors that influence output). Is it worth getting someone out to have a look at it? I would expect an unshaded, north facing, 10.26 kilowatt system in Brisbane to produce an average of around 48 kilowatt-hours a day in December. If they are only shaded for one to one and a half hours at the end of the day, you should only be losing a small amount of output, so an average of 45 kilowatt-hours sounds good, but a week is too short a time to get a proper average. If the skies were cloudless then it would mean your system was underperforming and if it was cloudier than average for December your system could be performing very well. If there is someone in your area with panels that face more or less north, then you could adjust for size and see if you are getting more or less the same result. If that’s not possible you can keep track of daily output and weather conditions. If, after you have collected data for several cloudless days, you don’t have a day when output approaches 60 kilowatt-hours it is possible the system has a problem, but at the moment there’s probably no reason for concern. Curious.. If a 5kw inverter with 6kw of panels can produce 35kwh/day , wouldn’t you expect a 10kw inverter with 12kw of panels to produce double I.e. 70kwh/day ?? … Now as Kyle only has 10.26kw of panels (~17% below 12kw) then one would expect a maximum of ~58kwh/day (~17% below 70kwh) on a clear day @ 25degree. ??? A 5 kilowatt inverter with 6 kilowatts of panels can produce 35 kilowatt-hours in a day, which is 5.8 kilowatt-hours per kilowatt of panels, but only on a clear day. Even in December, normally the best month for solar generation in Brisbane, the average will be lower. I’m Having a problem with my system. it’s 10kW Fronious Grid Tie Inverter. I’ve installed only 2.5kW System along with it(10x250W Chinese panels) or the sake of observation the system’s output. in the first two month of installation, the system was producing around 18.5kW on peak. However, after several month (5-7 months) the system now producing only 600 or 800 on peak!. I understand that on such a big inverter (10kW), it’s recommended to power it with something around 7-9kW, and it’s recommended on the specs to install at least 5kW to achieve the mentioned or claimed efficiency on the specs of 95% (For the inverter itself), but the thing that there’s a significant amount of loses here. If this was a grid tied system installed in Australia I’d say get the accredited installer to look at it. But that doesn’t look like it is the case. You can take the simple step of rebooting the inverter by disconnecting if first from the PV array and then from the grid and leaving it off for one minute. You can check the cable connections and if the panels are covered in dirt. You can check each panel to see if their output is almost identical as if one panel is performing badly it will bring down the performance of all the others. But, anything more complex than rebooting the inverter or cleaning the panels is potentially dangerous and if you don’t have the training to do it safely I strongly getting someone who is trained to check it. thanks for replying back Mr. Ronald! it’s not installed in Australia, and the simple rebooting is not the answer as the system reboot itself daily (shut off during sunset). I’ve checked the output from PV power supply, discovered that the short circuit comes at 6.55 A while the voltage around 333V (10 X 250W series connection ” PV rating at 8.5A max 33.2V max). In addition, I don’t personally think that dirt may cause this hug drawback on the system. But just to be in the safe side, I’ve cleaned them and the problem still occur. Could it be that one panel is damaged and leading to this problem? I don’t know how Fronius inverters reboot, but you may need to turn off grid power as well. But there is only a small chance this will help. It is certainly possible that one panel isn’t performing properly and causing the problem. Apart from checking the panels and wiring I’m afraid there is not much I can suggest. What you should have added to your analysis is the angle of the sun based on the time of year. My 10kw systems varies 10% per month based on the month, my greatest production being June and worst December, this varies by 50% throughout the year. I have 5KW solar panels on the roof of the house. The inverter is 5KW Fronius have 2 inputs. I have 2 arrays of the solar panels, first array consist of 11 panels and the second array consist of 9 panels. The solar panels are Canadian 285W. Every array has a switch. When we switch off one array , the inverter turn off as if there is no power coming from the second array. Please, What would be the problem, and how to solve it? Firstly, if the system operates normally and provides the output you’d expect, then there isn’t really a problem. But that’s not a very satisfying answer. If you are shutting down a string while there is DC power running through it your inverter may be detecting that as a arc fault or other fault and so it shuts down as a safety measure. To test this you could shut down one string at night to see if the inverter operates off one string in the morning. If you are still concerned you could contact your installer or inverter manufacturer and see if they can help. If you scroll down on the inverter display with the down arrow, you can see the voltage and current from MPPT1 and MPPT2, if you don’t see MPPT2 it maybe that MPPT tracker 2 isn’t on. Finn, Ive got a 6.6 kw system installed 3 weeks ago, north facing. Panels are LG, a fronius 5kw inverter. Its been cold but sunny most days since my system was installed, they are not shaded. the output has never exceeded 3.8kw. Im disappointed, I was expecting 5. Overall im getting about 20kwh / day so Im still doing OK, but I thought the output would be higher at peak times. I don’t know where you are, but in the more southern parts of Australia, such as in Melbourne, the output of north facing panels at noon under a clear sky in winter can still be fairly low do to the low angle of the sun above the horizon. This makes it difficult to draw conclusions from the peak output of the system. Looking at the around 20 kilowatt-hours a day you producing it likely your system is performing acceptably, as the average for June for a system like yours is only around 17 a day for Melbourne and 22 for Sydney. However, 3 weeks is too short a time to be certain as it depend on what the local weather has been like. But the good news is your system is probably performing acceptably. Thanks Ronald 🙂 Thats reassuring, and my solar must have read my mind as the following day it reached 4.6! In in SA. A friend who lives in Palmyra (6157) just had a 3.3 kWp system installed, 12*275Wp Trina Honey panels + 3kW Zeverlution inverter. Today was the first full day and I’m told it generated 18.9 kWh. That seems unusually high for the 24th of August… My 3.04kWp system (16*190Wp Suntech, SMA3000TL installed 2011, about 1km away from my friend, both north facing) did 13.8 kWh today. I expect my system is under-performing a little (1+% per year degradation), but the other seems to be overperforming a lot? That is excellent performance for a 3.3 kilowatt system, but it is within the bounds of possibility. In a 12 hour day one kilowatt of solar panels under excellent conditions can produce around 6 kilowatt-hours of energy. At the moment days are about 11 hours 45 minutes in Perth so a 3.3 kilowatt system could have produced about 19 kilowatt-hours. This almost never happens because conditions are rarely excellent, but looking the weather I see it’s cool at the moment, which helps with solar panel efficiency and if there is a breeze as well, which isn’t uncommon that would also help keep panels cool. LID reduces efficiency by about 1.5% in the first couple of days. Note that is percent and not percentage points. A 1.5% decrease in efficiency will cause a 16.5% efficient panel to fall to an efficiency of around 16.25%. Also the panels are probably perfectly clean which would also help. I’m afraid that getting voltage limited is the fault of the grid. While getting thicker cables could technically help it would make next to no difference for a properly designed system. The good news is in your location in August you would expect to average around 21-22 kilowatt-hours a day so you may not be losing a great deal of output as a result. I suggest keeping a record of when you have over voltage shutdowns of your inverter and then complaining to Horizon or Synergy depending on who you are with. If you know people with solar in your area with the same problem see if you can get them to complain too as I presume they won’t ignore multiple complaints. This costs several hundred dollars, but if you would find it useful anyway it may be worthwhile. If you have 3 phase power and a single phase solar inverter then replacing it with a 3 phase solar inverter could help, but this is an expensive solution for a problem the grid operator should fix. But it is something that can be kept in mind if your inverter needs to be replaced. In December 2017 my son & I each had 15 x LG335N1C-A5 panels installed in Melbourne, with Enphase micro-inverters. Each system 5.025 kW. The maximum power produced has been 4.01 kW. All my panels face north, while 7 of my sons panels face north-east and 8 north-west. It is interesting that his system always produces slightly more power per day than mine, even in winter. Peak power for both systems ihas been 33.2 kW/day. Installation was hassle-free by Gstore, on your recommendation. I am guessing your panels have Enphase S270 microinverters. They are rated for 260 watts but can at times do a little better, so you are not likely to see a maximum power result higher than 4.01 kilowatts. The good news is this is costing you very little energy output as even if they weren’t limited in this way the power output of the panels would very rarely go over 4 kilowatts. As for why your son’s system has slightly better output when you have all north facing panels, it’s hard to say. There could be a minor shading problem at your place or another issue. But if you are averaging around 17 kilowatt-hours a day or more then your system is doing fine and your son’s system is doing exceptionally fine. Like Hans in the example of getting only 80% of the rated output I also get 3.2Kw on clear days from my 4Kw installation. However, when there are cloudy days with regular good sunny breaks the system generates up to 4.0 to 4.2Kw during those breaks. Why does it give a constant 3.2 but can peak to greater than 4.2? There are two reasons why output during sunny periods on a partially cloudy day can be higher than on a clear day. Firstly, on a clear day panels in the sun get hot and stay hot and this reduces their efficiency. But when they are in the shade of a cloud they cool down and so have good efficiency when the sun does some out — until they heat up if the shade doesn’t return. Secondly, when the sun shines through a hole in the clouds the panels get full sunshine, plus diffuse sunshine scattered by clouds, plus some sunshine reflected off clouds around the hole. This means when the sun shines through a hole in the clouds the panels are being hit with more light than when it shines down in a clear sky. Thanks Ronald. That is clear and concise. I am currrently in VCAT arguing with Adam Dolkin of Solar Link regarding financial promises made for the installation of a system that have not been met. The first time i queried the system performance they referred me to your blog. The $5500 payback is based on 100% of production being used on site and zero exported to the grid. This was NOT identified in the quote. The system has been averaging 45% used on site and the balance exported to the grid, resulting in savings of only $3300 per annum. Are you able to reply offline with any comments that may be useful? Happy to help in any way I can – I’ve just emailed you. Hi, I had a 5kw system installed 4 years ago comprising of 20x250w Jinko panels and a SMA 3PH Tripower inverter. I’ve noticed over the last year or so in the December/January months the system is only producing 4kw max on sunny days, whereas at least the first 3 years it would produce 5kw. Is it a case of all panels slowly decreasing production with age or the possibility of some panels failing! All solar panels deteriorate with age, but it should average 0.7% or less per year. So it is possible that you have one panel that is under performing and dragging down the output of the whole system. But rather than look at maximum power output it is more useful to look at the number of kilowatt-hours produced. If you can see that the number of kilowatt-hours the system is producing has significantly decreased, then your system may have a problem. If you tell you your location I can give you an estimate of roughly how much you can expect your system to produce. I wish to have around a 6 kW system, is it better to replace the existing system totally OR add to it ? Without knowing the details of your situation I would lean towards removing your old system and replacing it with a large new system. This will give you a fresh new set of warranties for the panels and inverter. The disadvantage is the cost of having your old system removed. Alternatively you could have a second new small solar system installed while leaving your old one in place. It won’t be possible to increase the capacity of your old system as it won’t meet current standards. If some panels on the new system will have shading in winter optimizers can be installed on those panels to reduce its effects. But if shading only occurs for a small part of the day it won’t have a large effect on the overall output of your system. 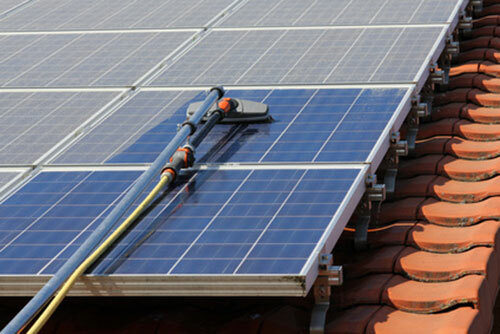 Personally, I recommend people install as much solar as is practical to put on their roofs, so you may wish to consider installing more than 6 kilowatts in total. Im confused. Reading this it seems the advice you are giving is NOT to oversize the panel array. Ive recently had solar installed. Following the advice on this site I oversized the array. Even in winter my panels are now producing more than 5KW at times (LG neon panels, 5kw fronius inverter). Are you saying this is now not recommended as safe practice? Oversizing solar panels so their capacity is up to 133% the capacity of the inverter is safe when done by a professional installer. While a small amount of solar output may be lost at times, overall it is cost effective when installing a new solar system. Increasing the panel capacity of an existing system is more expensive and if the existing system is an older one it can be very expensive as it may need to be brought up to current standards. Thanks Ronald. Im confused because I followed the link below to the CEC guidelines. My Fronius doesnt give its max input in w just in v. The CEC guidelines seem to recommend the inverter cant be overloaded. My installer was excellent and very experienced (Town & Country Solar) so Id trust them to ensure the system is appropriate. Is the CEC guidance just out of date? I don’t know what type of Fronius inverter you have but generally their maximum voltage input is 1,000 volts. Your solar system’s voltage won’t come close to that. Loking at the Fronius Primo inverters I see they can all accept a panel capacity that is more than 133% the capacity of the inverter. For example the 5 kilowatt Fronius Primo can accept 7.5 kilowatts of panels which would be 150% of its capacity. So you should definitely be in the clear. If you are still concerned let me know the type of Fronius inverter you have and I will look up its details for you.